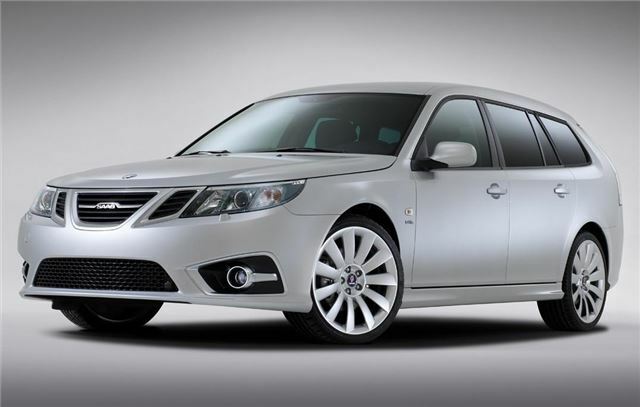 Saab is updating the 9-3 range for 2012 with subtle exterior tweaks, slight interior changes and more efficient engines. These include new direct injection petrol engines that give more power and 4 per cent average reduction in fuel consumption. The 9-3 saloon, SportWagon, Convertible and 9-3X models are all updated with new front bumpers with a deep air intake finished with black, ribbed bars, or a mesh insert for Aero models. Front fog lights are fitted as standard, with Aero models getting a matt chrome surround.The revised 9-3 also comes with Saab ‘ice block' headlamps. Inside the instrument panel, cabin trim and seat upholstery are all given a fresh look. Two specifications are offered in the UK - SE and Aero. There's a titanium metallic-effect trim around the instrument panel, gear lever, doors and glove box while Aero models get a graphite fibre-effect trim. SE models are fitted with leather comfort seats, while Aero models features new leather sports seats with contrasting stitching. Under the bonnet, there are new 2.0-litre petrol engines with either 163bhp and 220bhp which feature direct injection, variable valve timing and twin scroll turbocharging. Average claimed fuel consumption and CO2 emissions are reduced on average by 4 per cent across the range. These new engines join the current 130/160/180bhp 1.9-litre TTiD twin turbo diesel line-up which offers competitive CO2 emissions of just 119 g/km in both the Saloon and SportWagon. Further fine tuning has now also delivered a CO2 figure of 119g/km for the SportWagon, together with 62.8mpg claimed average fuel consumption.